It was the last place in the world I wanted to be on a sunny autumn afternoon, but the thrill of discovery pulled me into this cavern of moldering garbage. The warehouses of William H. Cooper Co. in West Humboldt Park have no electricity but plenty of running water, dripping from the ceilings and collecting in dank puddles at your feet. Light streams through the urine-tinted windows and cracked skylights to illuminate the wasteland that stretches before you. This is the site of “Two Histories of the World,” a temporary exhibition featuring four artists who were asked to create art from the rotting salvaged objects in the warehouses, which are exhibited on-site among the wreckage from whence they came. The artworks, if you can find them, are quietly subsumed back into the ruinous piles of debris by scavenging shoppers and fresh shipments of junk from newly dying industries. The William H. Cooper Co. feeds the supply of those savvy urban shops that refurbish junk into antiques. But if browsing the curated displays at Agent Gallery or Scout is like a stroll through Chicago’s grand old graveyards, full of picturesque statuary on un-littered lawns, then the William H. Cooper Co. is like Burr Oak Cemetery. It’s a mass grave of gutted garbage and humankind’s sad castoffs, the sort of place where you could bury a secret. 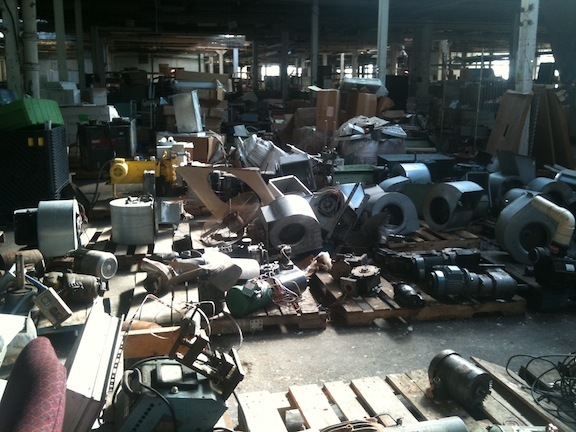 A recent shipment of materials came to the warehouse from the Michael Reese Hospital, demolished in 2010. Dusty medical equipment and organ refrigerators look like props from a b-grade sci-fi film. Feral kittens, at least four of them, scrap under some junk piles. It’s hoped that whomever lives in a shanty inside the warehouse, its door wallpapered with flattened potato-chip bags, won’t make an appearance during your visit. You’re likely to be greeted by the owner of this salvage business upon your exit. Muhammed Gheith is a kindly man in his mid-seventies. “Did you have a good time?” he asks, as if this were a carnival spookhouse. I ask him how long the business has been in operation. In response Gheith removes his cap, points to his gray hair, and smiles. He seems content with the absurd task of care-taking so much trash and selling it to whomever may find it. The warehouse is about 270,000 square feet on seven acres of land in a former manufacturing plant, open only in daylight hours because the buildings have no lights. The impulse upon entering the warehouse is to seek out its edges, to make a mental map and understand what kind of abstraction you are dealing with. The place goes on and on. Gheith jokes that Muammar Gaddafi is hiding inside, the recently murdered Libyan dictator. Perhaps Gheith was referring to the sewage tunnel where Gaddafi was found. 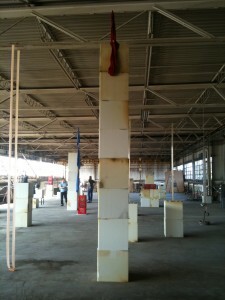 In the past few years, during our recession, spectacles of recycled art in derelict spaces have piled up. In 2009, Jan Tichy set up an exhibition space on a deserted floor of the Hancock tower to display some eerie projections, and Michael Ruglio-Misurell created an apocalyptic shopping mall at Gallery 400. Both of those immersive exhibitions welcomed viewers to explore how creative acts could create anew destruction. The Gazette, a neighborhood newspaper in Chicago, recently announced that the Salvation Army purchased the warehouses and will transform them into a new Freedom Center with beds for 500. The fate of William H. Cooper Co. is certain. It, like the salvage it houses, will become salvage. Soon, by the spring of 2014, its broken objects will give way to broken people needing a place to sleep for the night.